We are relaxing in our apartment accommodation in Paris. It is a very nice place, larger and more modern and comfortable than we had in Rome, although we really liked the Rome one. We were shocked this morning on the train when it suddenly came to a stop. It had been light outside for a while, leaking around the edge of the window blind, but both of us had assumed it was still quite early and were still dozing. But when the train stopped, M. checked the time on her phone and yelped that it was 09:30, our arrival time in Paris! We heard people outside moving around in the corridor, and after very quickly throwing some clothes on we checked out the window to see signs indicating Paris-Gare de Lyon! In a panic we dressed fully, organised our suitcases, throwing stuff together, getting jackets on because we knew it would be cold outside, and then raced out of our cabin and off the train. We shuffled along the platform with everyone else getting off the train, until we came to a set of stairs leading down with a sign indicating Metro line 14. We stopped to check a Metro map and confirm where we were going. We needed to catch a train on Metro line 1, so kept walking along the platform to the terminal. It turned out we needn't have hurried so much to get off the train, because there was a big pile up of people waiting to exit the platform, held back by police doing passport checks. We got ours out, but it seemed they were doing them randomly and not checking all of them, and we were waved through without anyone so much as glancing at our passports. Once through that, we saw the signs indicating Metro line 1 and followed them downstairs and along a tunnel a bit. At the ticket machines we managed to figure out how to switch them to display English and bought two single trip tickets - enough to get us to our accommodation and we could figure out cheaper multi-trip options later. A minute later we were waiting on the platform for our Metro train. It arrived soon and was moderately crowded, but not a problem. We stayed on until it reached Louvre-Rivoli, which is the closest stop to our apartment. 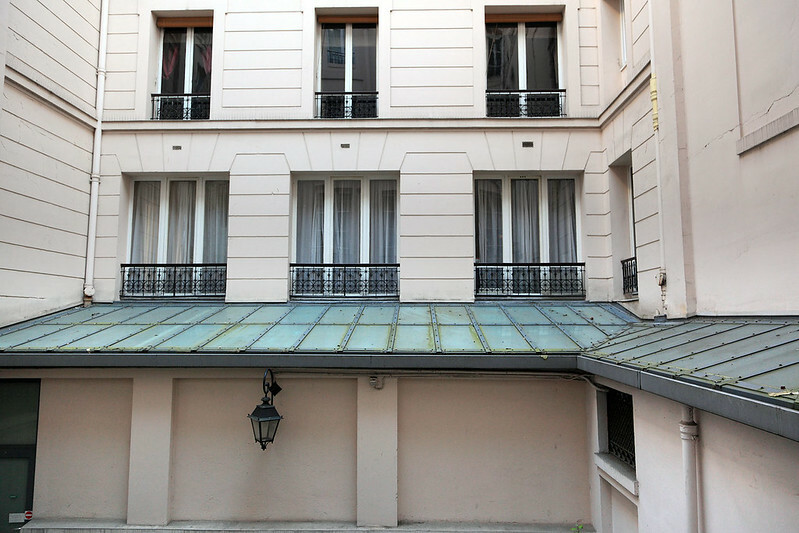 From there it was a simple walk of about two blocks to Rue Jean-Jacques Rousseau and the apartment. We entered the building using the instructions the owner had sent me and rang the door buzzer. The guy let us in, showed us around the apartment, took the balance of €100 owing, and left us to our devices. The first order of business was toilets and then showers after our last day in Venice and the overnight trip. Once that was done, we headed out to explore a bit. The time was now about 11:30, and we'd only had a few biscotti as a snack since last night's salad dinner, so we were hungry. Only a couple of doors down from the apartment we found a shop called Claus selling organic-looking products like mueslis and jams and stuff, and they also had some baked goods and a coffee machine, so M. decided to check it out. They turned out to have a breakfast menu, so I ordered a "le Hugo", which was a choice of coffee, tea, or hot chocolate, plus fruit juice, plus bread and jam, plus eggs with either ham or bacon. 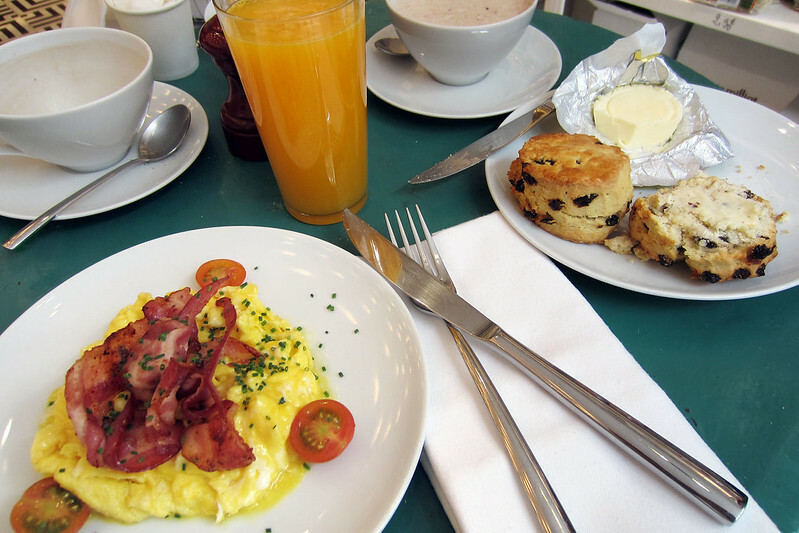 I got the hot chocolate, orange juice, and scrambled eggs with bacon option. M. got a pair of scones with butter and a cappuccino. The bread was amazingly good, with three different types in a basket, and the eggs and bacon were good too. M. said the scones were excellent too, reminding her of the ones we'd had in Devon in the UK. With this brunch done, we walked back to the Louvre-Rivoli Metro station and bought a carnet of ten tickets, which works out cheaper than buying them individually, and possibly cheaper than something like a five-day pass. 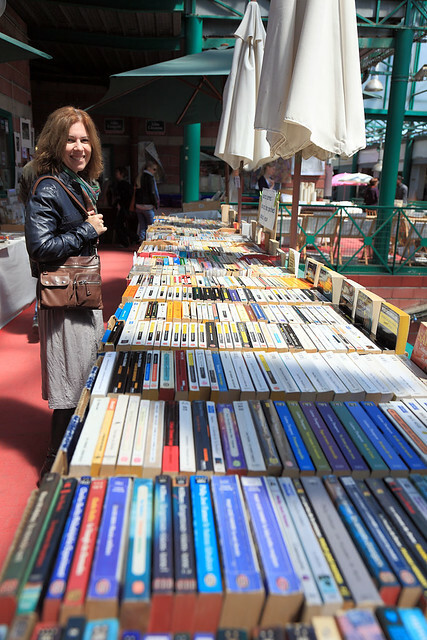 We caught a train to Châtelet and changed there for a number 4 line train to Porte de Clignancourt, which was the closest stop to the Marché aux Puces de St-Ouen, described as the largest flea market in Paris and best seen on a Sunday. As soon as we got off the station, which was a good couple of blocks walk from the market, we were assaulted by guys with hands full of handbags, belts, and fake Rolexes, pushing them in our faces until we bustled past them. Dozens of these guys lined the street all the way to the market and were rather annoying. The market stalls started a block or so before I expected them to, and seemed to be all jeans and T-shirts. This continued as we crossed under the orbital freeway and into the market area proper. It was rather disappointing really. But then after walking for a while we came across a covered building with two levels inside. This was more like it. It contained a lot of antique furniture stalls on the ground floor, mixed with a few other things, while upstairs it held a treasure trove of stalls devoted to old books, records, posters, photos, jewellery, postcards, artwork, vintage clothes and shoes, and all sorts of other knick knacks. There were old yellowing letters written in ink. There were issues of magazines from the 1940s and very probably even earlier, including Elle, Mode, Paris Match, and others. There were old newspapers. 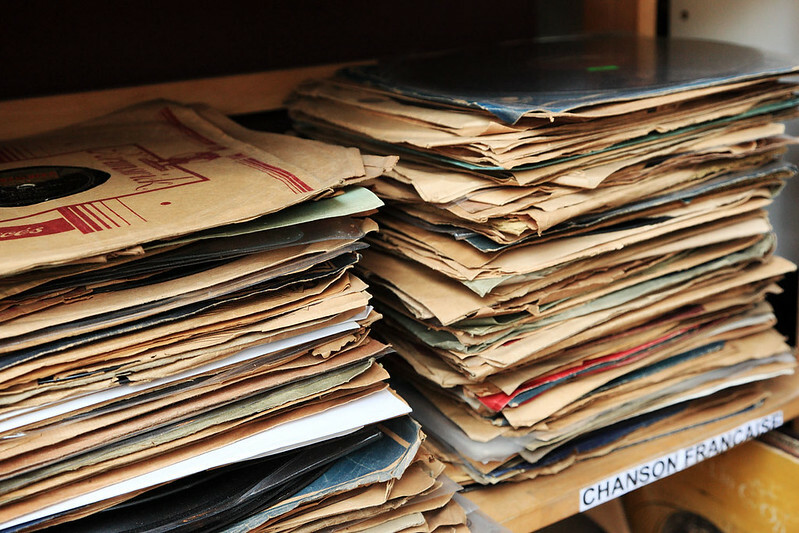 Basically anything that people normally buy and then throw out soon afterwards, you could find here dating back fifty, sixty, seventy years or more. I was half tempted to buy some really old Tintin books, but being in French made them not so useful for me. After browsing around in here for some time, we emerged into the street stalls again and were reminded how mundane and trashy they were compared to the old gems we'd just seen. 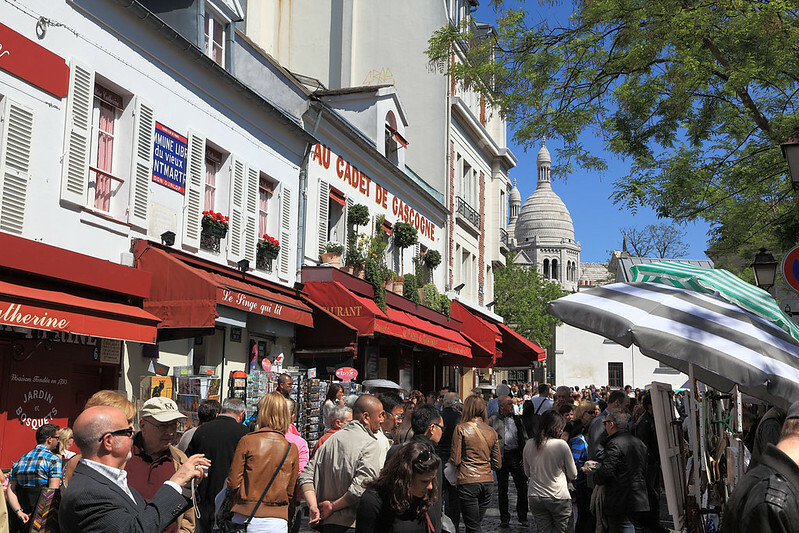 So after a quick explore to see if there was more good stuff and finding none, we cut short our visit to these markets and headed down a different street to avoid the hawkers and make our way to Montmartre. This took some walking to get to, and when we stopped at one point to consult a map, an older woman asked (in French) if we needed help. 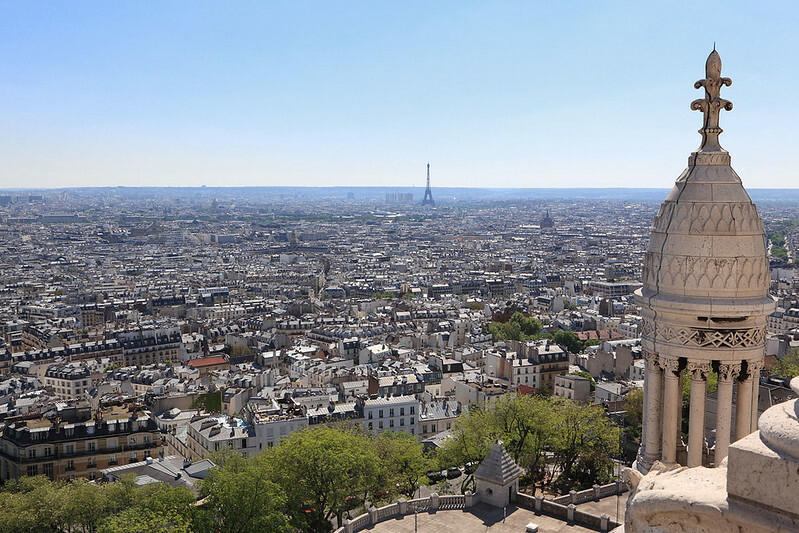 When I said, "Sacre Coeur", our destination, she pointed down the street and said the French words for "straight ahead, straight ahead, straight ahead!" indicating it was a long way. 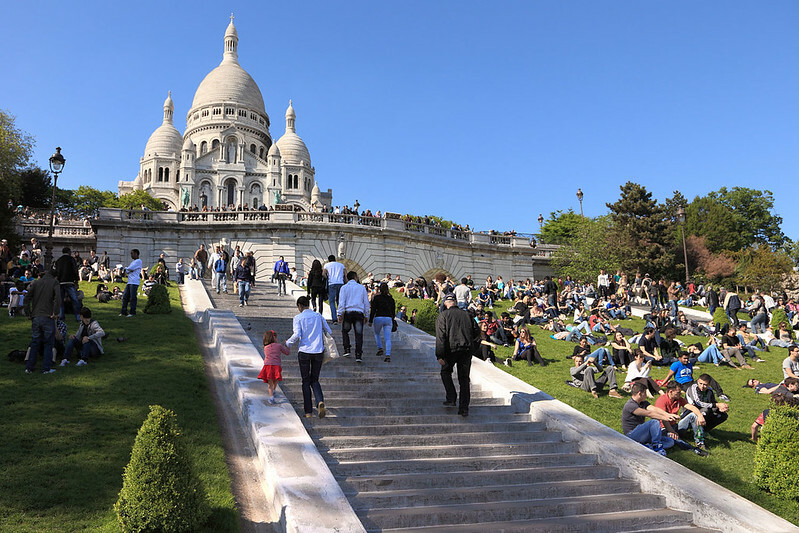 What's more, Montmartre is the hilliest part of Paris, and Sacre Coeur is on the top of it. Our entire walk was uphill, except for when we entered the Cimitìere St Vincent, hoping to cut across it as a shortcut and found that it had no exits on the uphill side, forcing us to backtrack across the entire cemetery and go around it. We wound up in Place du Tertre, the tiny old town square for Montmartre village before Paris absorbed it. This area is now absolutely crawling with tourists, presumably here for the picturesque cafes and shop-lined streets that ooze old-timey Paris atmosphere, if it wasn't spoiled by all the tourists that is. We stopped to get a couple of panini at a small stall that had those and made crepes as well. I got a ham one and M. got one with three cheeses, at least one of which was Camembert. The square of Place du Tertre itself was centred with al fresco seating for the numerous cafes that surrounded it. The next concentric ring out from the seating was filled with artists offering to do sketches or caricatures or pastels or watercolours of tourists. It was so crowded here that we had to brush past people just to walk around, and we kept a careful grip of our belongings in case of pickpockets. Leaving the Place du Tertre, we emerged at the top of the Montmartre hill, and the fantastic gleaming white edifice that is the church of Sacré Coeur. It's very large and impressive, and commands an amazing view over the city in all directions. We went inside to view the interior, which was lavishly decorated, with a huge mosaic of a large Christ surrounded by various smaller people, presumably apostles or saints or angels or possibly all three, filling the domed ceiling above the main altar. It was beautifully coloured and had lots of gold in it. We rested on some pews in the cool interior, out of the sun. A couple of nuns began handing out sheets of paper to people seated near the front. We were near people who got one, but didn't get offered one ourselves. Since it was Sunday, we figured maybe a service of some sort was about to start. We got up and starting walking around to see all of the things within the church. As we walked around the enormous church, a group of nuns emerged from the sacristy area and took places on the raised area around the altar, then began to sing. The paper sheets were hymn lyrics for people to join in. The singing continued as we finished exploring the church, adding a beautiful ethereal quality to our visit. We wanted to climb up the dome of the church but didn't find an access place inside. Presuming it to be outside, we emerged into the bright sunshine again and found a sign pointing around the left side of the building. Here we found a ticket booth and entrances to both the dome and the crypt. We paid €8 each for both and chose to climb the 300 steps up to the dome first. These took us a moderately tight spiral stone staircase a long way, emerging eventually on to the roof of the church, but with the towering dome still above us. We climbed some external steps up the sloping roof to the base of the dome, then went inside again to climb further up a much tighter spiral staircase. This brought us to the observation ring around the dome, which had splendid views over all of Paris and out into the countryside beyond. The day was bright and clear and we could see a long, long way, taking in all the famous sights of the city. This gave us our first view of the Eiffel Tower, a mere matchstick in the distance, away across thousands of rooves punctuated by domes and spires of smaller churches. We did a slow circuit of the dome and then climbed down via a staircase on the other side, letting us out on to the roof of the right side of the building, from where we climbed up over the peaked roof at the front to return to the left side of the church, where another wider staircase led us all the way back down. Next we entered the crypt of the church, which was an immense space in itself, with a very high vaulted stone ceiling above supporting the main floor of the church. 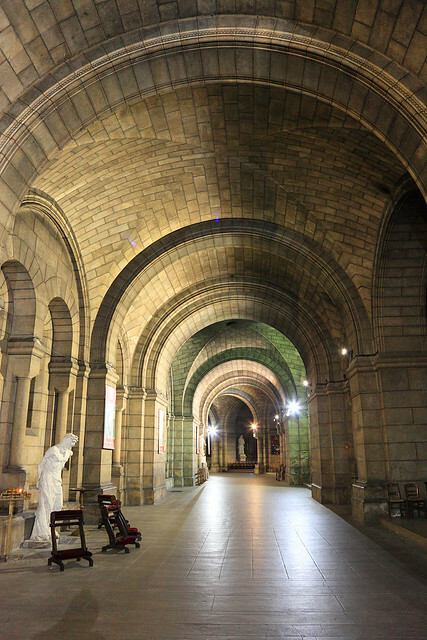 The crypt contained several statues including one of a very creepy looking priest or cardinal. It also had three separate reliquaries in which we could see bones, presumably of saints. Emerging from the crypt, we walked down the steps in front of the church, enjoying the views along the way. The steps and the grass areas between them were full of people enjoying the sun and the views, and it got a bit crowded in places. At the bottom of the steps we continued walking straight down the street there to the nearest Metro stop. Along this street were dozens of souvenir shops. M. picked up a Paris T-shirt from one. We got on the Metro at Anvers station and rode it home to Palais Royale-Musée de Louvre via Stalingrad station. Since it was after 19:00 by now we decided to go straight for dinner to get an early night. However, the Lebanese and Moroccan place right across the street from us which we'd noticed earlier and targeted for dinner wasn't open on Sunday. Instead we walked up to the north end of our short street and tried the Café des Initiés we'd spotted earlier, which had burgers including a vege burger on the menu. M. said the place reminded her of the New Orleans Cafe back at home, since it was sort of half-pub-like, with people just popping in for drinks at the bar. Our waiter was a chirpy chap with a beret who looked like Guy Sebastian and spoke good English. The burgers came with chips and coleslaw. 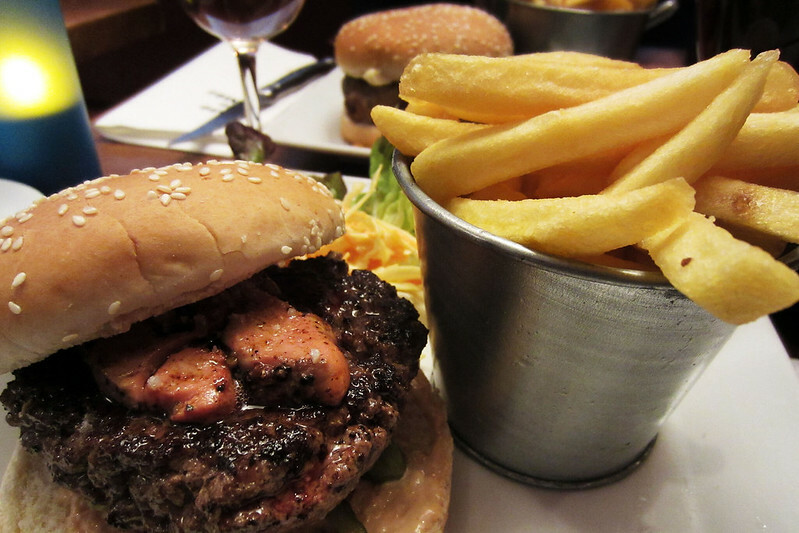 I ordered the beef burger with grilled foie gras on it, since we're in Paris after all. The condiments on the table are different from Italy. There we had extra virgin olive oil and balsamic vinegar. Here we have mustard. It was slightly spicier than the French mustard we get back home, and I added some to my burger. The chips came with what I presume was a dipping sauce that looked like mayonnaise mixed with tomato sauce. It was all really good. I had a Pelforth brown ale with my burger - French beer! - which was good too. And for dessert they had a "half-cooked" chocolate cake with vanilla ice cream, which I had to try. 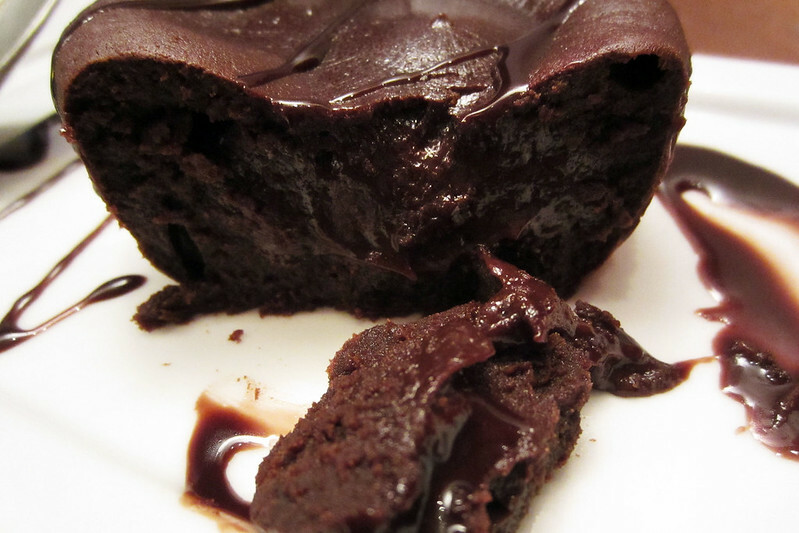 It was an individual sized cake, which when cut into with a spoon revealed an interior core of gooey brown goodness that reminded us of the hot chocolate M. had in Venice. Really good. Following dinner we headed home, showered, and relaxed for a while before bed. M. read some of the novel she'd brought along while I typed up some diary. Last updated: Wednesday, 19 July, 2017; 01:20:55 PDT.